Terrible Toybox released Thimbleweed Park recently for home consoles and PC. The point-and-click throwback is an homage to LucasArt classics like Maniac Mansion and indie titles like Hugo’s House of Horrors. Well, for gamers looking to get a little help in completing the game, there’s a walkthrough guide available. The game takes place during 1987, and part 1 starts with players in control of Boris. You’ll need to turn off the light above the sign in order to signal that that you’re ready for the meeting. You can talk to the drunkard just beyond the gate, but he says nothing of importance. Use the rock in the water and smash the light. Proceed to the large entrance just to your right in order to meet the person for the meeting. Only… Boris doesn’t make it out of the meeting. That ends Part 2. The game then switches over to Antonio Reyes and Agent Ray. You can check the notes to give you a quick synopsis of both agents. You can also click on the portraits in the top right hand corner to switch between Reyes and Ray, as indicated in the video walkthrough below from Games Shelter. Have Reyes give Ray the Polaroid camera and put the Polaroid film in the camera and snap a photo of the body. Check the body and grab the hotel room 1105 keycard. Head into the bushes and there’s something under the underbrush – it’s a chainsaw! Head back to the sign post and pick up the empty whiskey bottle under the sign. Go out past the gate and pick up thr open tuna can. Pick up the “Behind Jagged Lines” Atari cartridge and continue heading to your right. There’s a flyer on the ground; pick it up. You can talk to the two sisters in the plumbing van and keep heading east toward Thimbleweed Park. Proceed to the Sheriff and then go and talk to the Coroner. You’ll have a list of objectives to complete, as listed below. Talk to the three 3000 machines to get a better understanding of how each machine functions and how to use them. You can head upstairs to talk to the Sheriff again. You’ll find the Sheriff upstairs. Ask him about the Arresttron 3000. You’ll first need to use all three of the other machines first before the Arresttron can issue a warrant. After talking to the Sheriff, you’ll need to interview more of the residents of Thimbleweed Park regarding the recent murder of Boris. Head outside and the two sisters in the pigeon costumes will be outside attempting to fix the water leak. You’ll need to head to the outskirts of town to trigger the cinematic with the Sheriff. Head to the outskirts and the Sheriff will inform you about getting an official map before you can venture any further. There are no maps left inside the Quickie Pal due to the Sheriff having grabbed all the maps beforehand. Talk to Leonard and then head into the bathroom with the huge toilet – a throwback to the abnormally large toilets in video games during the 1990s – you can examine some things in the bathroom if you wanted to explore everything in the room. Head back into town and talk to Lenore at the bus station. You can ask her about the body and PillowTronics. Ask about Lenore’s relative Dolores, and a flashback will put you in control of the game developer. You’ll need to check the mailbox and check around the house. Grab the red decoder from the bottom bookshelf and then head downstairs to check the mailbox to get the computer magazine. Once you get the magazine and find your ideal job, head back up to the computer and fill out the job application using the dial-up modem at the MmucasFflem website. The postal worker, George, will also come back and ring the doorbell in order to deliver a special letter for Chuck. Dolores can take the letter after opening the front door. You can give Chuck the letter. Back in Dolores room, boot up the computer and fill out the application for MMucasFlem. Choose Dolores name, and her address. It’s 5858 Edmund Dr, Thimbleweed Park, WY. For the next question, regarding how many actors can be displayed at one time, the answer is: B: 8. For the debugger question, the answer is: B: A separate monitor. For the question about what room backgrounds are compressed into, the answer is: C: Character Set. For the last question the answer is: A: True. If you would prefer to manually get all the answers yourself, you’ll need to check the library for the appropriate books that discuss the MmucasFlem programming philosophies. Next you’ll need to print out your application, however the printer will be out of ink. Talk to uncle Chuck and he’ll tell you to make your own ink using polycyclic hydrocarbons and methylethylketone… basically ash and gasoline. Head downstairs and grab the broken ketchup bottle from the refrigerator, along with the old lettuce, pop can and batteries. Put the log into the fireplace and drink the chili sauce to put the fireplace on fire. Head back into the kitchen and turn on the faucet. Fill up the glass with water. Put out the fire in the fireplace. Fill the ink bottle with the black soot from the fireplace. Combine the gasoline can with the ink bottle. Add the ink bottle to the printer and put the paper into the printer. Use the computer and print out the application. Take uncle Chuck’s letter downstairs to the microwave and put the letter inside along with the cup full of water. Take the letter out of the microwave along with the stamps and place the stamp onto the application to MMucasflem. Open the mailbox in front of the house and place the application inside. Take the letter back into Dolores’ room to open it. 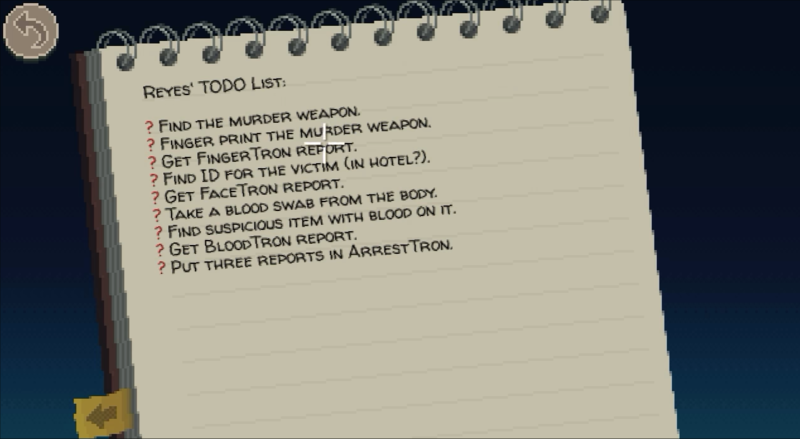 After Dolores’ segment ends this will update Reyes’ to-do list. When the game switches back to Reyes, head back into town and enter the cafe. You can pick up a speck of dust off the floor while in the cafe. Talk to the waitress at the diner and ask about murder and Thimbleweed Park. During the talk with the waitress, a flashback will occur and players will take control of Ransome the Jerk… a clown. Ransome will need his nose, joke book, clown-fro and makeup before he can go on stage to insult people. The nose is on the clown doll by the bed. Pickup the red nose and then use it to apply it to Ransome. Exit the trailer and go into the tent and take the makeup on the makeup counter. Put the makeup on. Take the styling gel and apply it to the clown-fro. Go back outside and talk to the Carney Joe with the duckies. You have to get the joke book back from Joe, but you need $1138. Go to the back entrance of the big tent and take the $138 from the swear jar. Take the money to Joe and give him the $1,000 plus interest. Get the joke book and head through the back entrance and go on stage. Start the routine with the Pillow Factory joke, and then follow it up with the Tron joke next. Insult the old lady and she will curse Ransome. The flashback will end and you’ll be back in charge of Reyes or Ray. You can pick up the hotdog and they’ll vomit it out in the back of the diner. If you attempt to check the trash can then Reyes will get hit by the monster and dragged into the alley. Switch over to Ray and go pick up the dime in front of the Safety First Savings bank. Head into the alley where Reyes was taken out by the murderer. Take Reyes’ notebook and then head to Ricki’s Cakes store. Ask Ricki about a WC-67 HydrantTron tube so you can given the item to the pigeons and they can repair the broken water main. Once the main is fixed, head into the alley and a cinematic sequence will cue up. Once the cinematic is done have Ray go down the street and pick up the speck of dust. Check out Reyes’ notebook and head just beyond the outskirts of town. Ray will wonder what’s Reyes is up to and you can switch to him. He’ll be down inside of a maintenance hallway. Go over to the ladder and look up at the Quickie Pal. Have Ray to go over to the sewer and look down. Have Ray drop the dime down into the sewer so Reyes can use the pay phone. Switch back to Reyes and pick up the speck of dust and the dime. Use the dime in the payphone. Have Reyes call German Pique Garcia at 7447. The Sheriff will get Reyes out of the sewer. While at the Sheriff’s place, use the photo of the body in the Facetron 3000. Use the toilet paper you got from the bathroom and go back to the dead body in the river; use the toilet paper on the body to get a blood sample from Boris. Head toward the cemetery and go to Chuck’s grave where there is a flower that you can take. Head back to the bathroom and dry the bloody toilet paper using the hand dryer. Head into the quickie mart and exchange the bottle for 5 cents. Go to the Sheriff’s place and head into the coroner’s office and place the dried toilet paper into the BloodTron 3000. Go into the Thimbleweed Nickel and talk to the journalist, Natalie. Ask her about the Pillow Factory, the history of the Pillow Factory, and the Pillow Factory fire deaths. Next head into the postal office and talk to George. Take some sticky tape from the roll. Head outside and talk to the drunken bum. The bum will have a wallet you’ll need, but you’ll need to give the bum a replacement for the wallet before he’ll hand over the one he has. Go into the occult bookstore and talk to Madam Morena. Grab the bottle of eye drops and the case of tea. Climb to the top of the book shelf using the ladder and grab the “Book of the Dead” from the very top of the shelf. It’s free. Head back into the news outlet and then switch to Ray. Have her go into the Sheriff’s office and use the police radio. Have her send out a distress call about a woman by the old estate swinging an unlicensed pitchfork. Switch back to Reyes and have him take the map and place it in the CopyTron 3000. Use the 5 cent coin on the Copytron 3000 and make a copy of the map. Place the original map back on the wall and take the copied map to help you get around town beyond the outskirts. This will end Part 2 and begin Part 3: The Arrest.